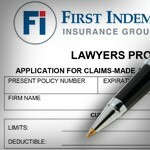 To prepare and submit your renewal application for First Indemnity's Lawyers Program, you may select one of two submission formats. To complete a fillable PDF form, select "Download Fillable PDF to Your PC". If you prefer to download a simple PDF application to complete offline, choose "Downloadable Static PDF".